For anyone interested in considering all the storied ways how the Liturgy of the Word proclaimed through preaching brings us closer to God. Ideas and suggestions for how to preach without preaching by offering testimonies are shared. 2. Religious & Laity in Formation For nuns, priests, deacons, catechists, or lay ministers in formation who will be preaching. Offer simple tools to promote personal reflection, audience analysis, and storytelling to develop good preaching practices. For preachers question around key moments of the interview to encourage homilists to reflect on discovering their unique voice as a preacher. Pinpoint techniques, approaches and best practices of impactful preachers. Consider creating a prayer journal. Jot down a few words or phrases as you reflect on the questions that speak to you most. Reach out to a brother or sister in Christ to discuss the questions. Incorporate the guides into a regular bible study or discussion group at your church. Create a tool book of your favorite preaching ideas and techniques that you can use when you are preparing homilies. Incorporate the guides into courses, self-development activities and retreats. 1. Fr. Godfrey remarks on Pope Francis’ practices for good homilies: short, to the point, with a good story, and that engage people. Think about some of your recent homilies, how would you score yourself on these practices? Finding one or more stories to ground your homily is key to succeed in having a good point, being short and engaging people. Here’s a simple tool for working at key points and discovering stories. Start by writing a list of key words that describe and characterize the readings – look for patterns in the words that you capture here. 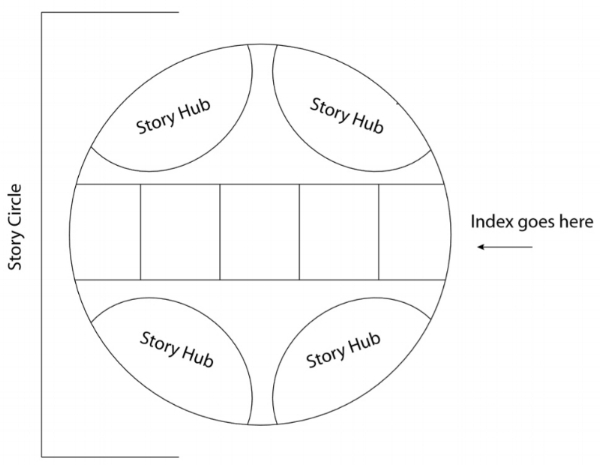 These words are your index – and can be written in the boxes in the middle of the Story Circle diagram. Let the words act as triggers for thinking about times, situations or stories from other domains that allow you to these ideas to life. Write a short phrase in the in the Story Hub to represent possible stories. This tool also will help you weave multiple stories together to bring your points alive and engage people. 2. Fr. Godfrey feels as homilists we are not always taking it either seriously enough by dedicating enough time to the process. What is your current process for preparing to preach? When do you start? How have you made the practice of prayer a part of your preparation? Do you use any scriptural analysis tools? Have you tried the resource mentioned by Fr. Godfrey Text Week? 4. Preaching to diverse groups of people including many who are to Catholic can be challenging. Reflect on the times when you have been a situation where many of the people were not Catholic. How did you approach this homily? 5. Fr. Godfrey recognizes the difficulty of preparing challenging homilies. He makes a distinction between trying to change people and encouraging people to rethink their ideas, belief, attitudes, and behaviors. Fr. Godfrey asserts that giving people a sense of hope may be the strongest vehicle for inciting “rethinking” that has the possibility to lead to self-motivated and fueled changes. Think about a time when you recently had a challenging subject for a homily? How did you approach the topic? What worked? What might you do differently to encourage people to rethink their perspectives? How did you give people hope? What might you do differently? 6. Fr. Godfrey talks about the importance of finding his energy, engaging with himself and discovering his passion. How do you balance preparation with make space for the spontaneous? 7. Fr. Godrefy points out that St. Ignatius talks about taking each person where they are. God encounters each of us in different ways. What are your current practices in imagining the diverse backgrounds of your parish and how the Holy Spirit may need you to plant seeds that will allow God to work through your homily to encounter those present? Is there anything you might want to differently? 8. Fr. Godfrey discusses the danger of making a sermon too much about ourselves. He cites the examples of either trying too hard to entertain people or telling our personal stories in a way that is self-serving. What are your current practices for filtering and assessing the intention of your stories and examples? On the other end are you shying away from bringing some of yourself and experiences in a meaningful way to your preaching?